One of the accusations launched at Topps during its years as a monopoly card maker is that many of its set designs are pedestrian and generic. While that may have been true some of the time, there was the occasional set that came out whose design was exceptional. 1971-72 Topps Hockey is one of them. 1971-72 Topps Hockey card fronts have a player picture superimposed in front of a solid-colored background and inset into a circular frame. His team name appears in a wilder font than Topps usually featured, with a curved effect that had the letters get larger on each end. Below the picture was a team logo, the player's name and position. 1971-72 Topps Hockey card backs are laid out in a vertical format. The card number appears in an orange-colored box, with the player's name, team city and position in a green area beside it. Two boxes appear blow that, with vital stats on the left and a cartoon to the right. A biography follows, as well as a year-by-year statistical review, the first time a Topps hockey set ever used those. The first six cards in 1971-72 Topps Hockey feature the previous season's three league leaders in several statistical categories. Also, one checklist card appears in the set. Interestingly, the leaders cards are not featured in the 1971-72 O-Pee-Chee Hockey set. This is an unusual occurrence where Topps featured its own subset. One key card of the set features Gordie Howe, who has a base card in the Topps set but not in OPC. 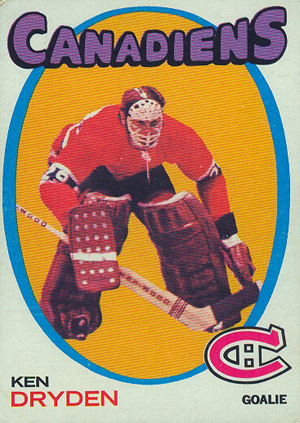 The only notable rookie card in 1971-72 Topps Hockey features Ken Dryden.